Starters and alternators have always been the most important energy sources of a car. Components that you as a driver want to be able to rely on 100%. You want to provide your customers with reliable products with a long life and excellent performance. Then Kavo Parts is the right address. All our starters and alternators are manufactured by OEM manufacturers. Specialists in their field who, with advanced technologies and innovations, guarantee ultramodern products that perfectly meet today’s requirements. Tested under the most extreme operating and weather conditions, we ensure a smooth start in any situation. Our starters and alternators are also ideally suited for the increasingly popular start-stop systems. In a start-stop system, the number of starting operations is significantly increased causing the starter and the dynamo to be more heavily taxed. 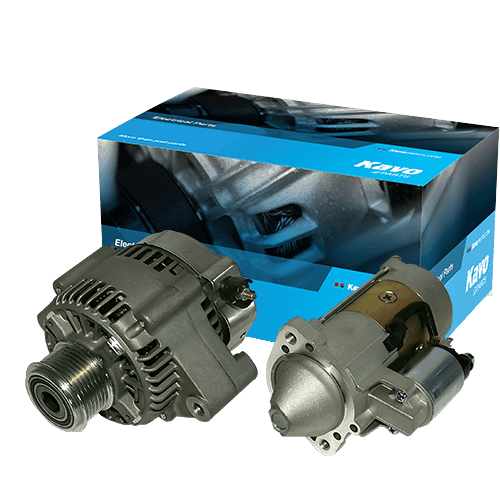 Kavo Parts has an extensive range of starters and alternators for Japanese and Korean cars. All 100% new and with a 3 year warranty, as on all our products.